“My breath hole – it’s closing up!” I wheezed as the pain in my chest slid down and burrowed itself into my ribcage. We opted not to go the hospital, mostly because the thought of explaining my nerves to a doctor (“And we’re moving into this beautiful house, and I have to write this article…and life is just so hard…“) mortified me, so instead I tried violently cuddling my cat for a while since I’d heard pets lower anxiety. I told my BFF about it this morning. She’s a therapist, and I’m telling you, having a therapist for a BFF is so handy. “It sounds like you had a panic attack,” she told me. I had thought I’d had a mini heart attack, so now a panic attack doesn’t sound too bad. Speaking of problems, one of our new guys, John Frels, is having a particularly interesting conundrum that we need to discuss. See, John is a tidy guy who likes things just so (which is good for his clients – trust me, you want a mortgage banker who likes things just so). Well, readers, things certainly have not been just so in the men’s bathroom on the fourth floor in our building, and John is peed off (get it?). Last week, Just So John strolled up to me holding out a sign he’d just printed. What is 5225 Katy Freeway coming to? First of all, a lady offices in the ladies’ room, and now this hoo hah in the men’s? I followed up with Just So John today to hear any developments. Just the Assistant: Okay John, you hung the sign last week. What’s the scoop now? Just So John: Oh, somebody took it down. JTA: Took it down!? We’ve got to find whoever took it down! JSJ: It was probably the Sprinkler! JTA: Good point. What’s the “situation” in the bathroom now? JSJ: Oh, a bit better. JTA: Do you have a plan B? JSJ: Not really because I don’t know who’s doing it. It could be a client or a visitor in the building. JTA: Dude, it better not be a client. That’s gross. JTA: Totally. Don’t worry John. We will publicly shame him on the blog and maybe things will clear up. I don’t care if it is a client. Okay folks, you all have a lovely weekend. 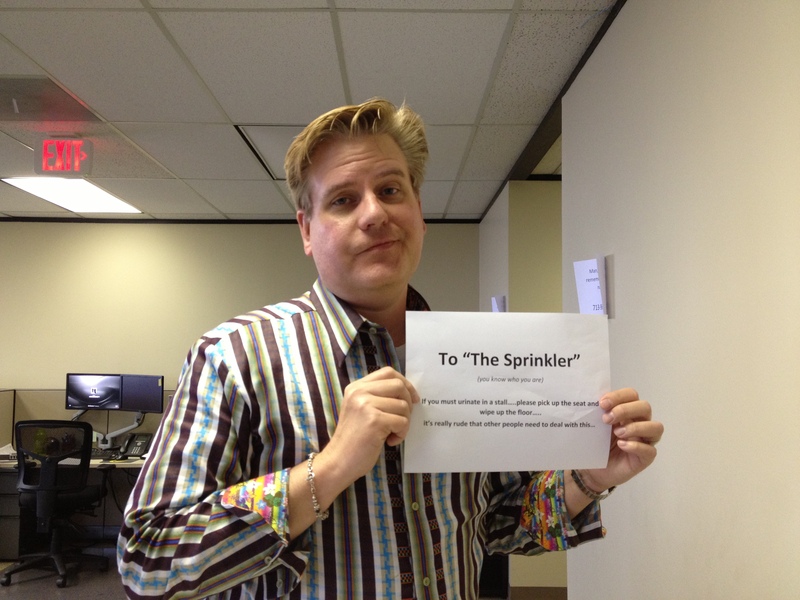 If you see the Sprinkler, slap him upside the head for us, will ya? But if you happen to see me over the weekend, slip me a Valium. Off to pack the cat. Your writing makes me think of Sophie Kinsella’s Shopaholic. So fun! That’s the best comment ever! That’s GREAT! 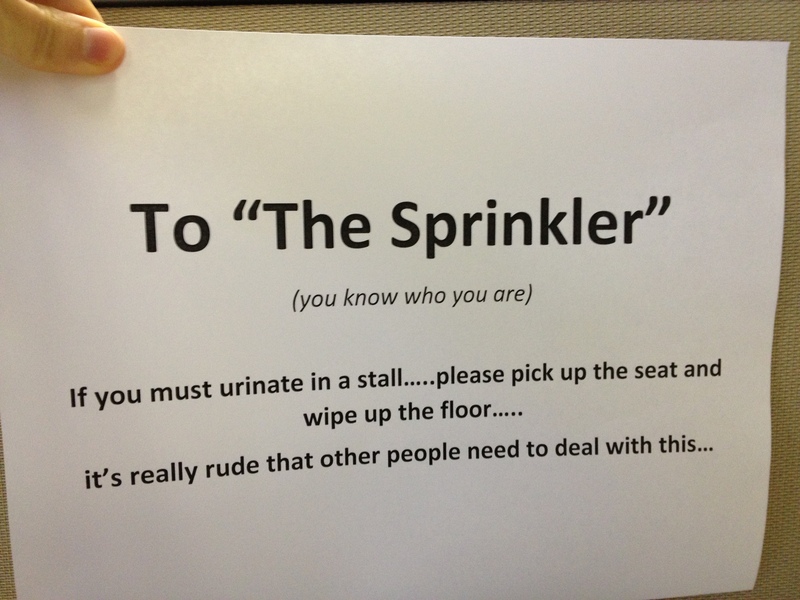 Much better than “be a sweetie and wipe the seatie.” Only John….